Before the ballpens took over, fountain pens were standard writing instruments in the Philippines, used in schools, offices, and for signing important documents. Fountain pens were filled up with ink—and one dominant brand that would become a staple import from the 40s through the 60s was Parker QUINK. The brand name QUINK is a coined term that combines “quick” and “ink”, and was first introduced in March 1931, by the Parker Pen Company. It was developed for the company by chemist Galen Sayler of Miner Laboratories, in Chicago. The general-purpose ink was an instant success, as it had superior ink flow, water-resistant, and true to its name, it was quick-drying. Its formula included an exclusive additive known as “Solv-X”, which eliminated clogging. QUINK was supported by massive advertising. And by the time it reached the Philippines in the 1950s, it had become a household name. 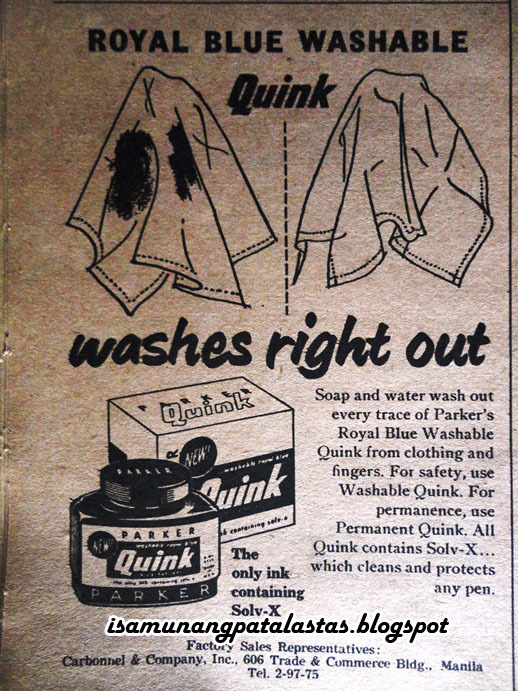 QUINK was imported from the U.S., and its Philippine representative, Carbonell & Co. Inc, marketed and distributed the product in the 1950s. Other distributor-manufacturers included Exclusive Distributors Corp .of Makati, and H. G. Henares & Sons, Inc. in 1961. It was available in Blue, Black, Blue Black. Red, Green, and Turquoise Blue colors. Did a Filipino Invent QUINK? 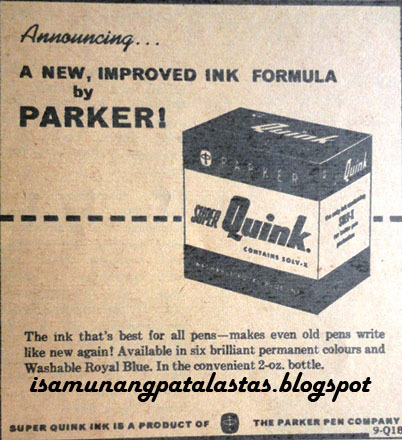 For many years, it was believed that a certain Francisco Quisumbing, a U.S-educated Filipino botanist, was instrumental in inventing QUINK, and that his name inspired the product brand name (QUIsumbing INK). Parker records, however, showed that no such person worked with the company. But there was indeed a Francisco A. Quisumbing, a 1914 U.P. chemical engineering graduate who also earned a Ph.D. from Columbia Univeristy in 1921.This Quisumbing founded Quisumbing Inc. Products which supplied Philippine government bureaus with ink.There is no concrete evidence nor reliable documentation that he had something to do with QUINK. 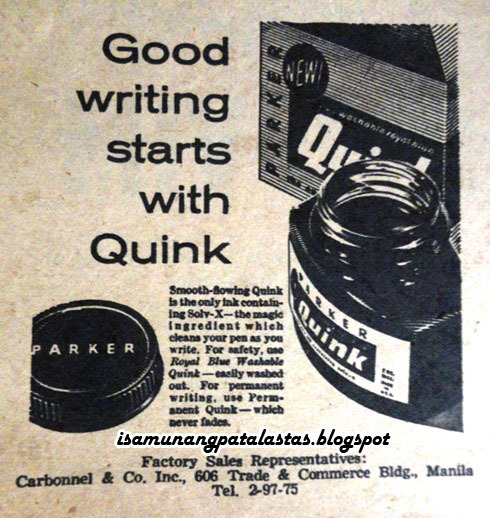 When QUINK was later manufactured in the Philippines under license from Parker, all the bottled products were properly marked with the Parker name. The reign of the fountain pen ends. Fountain pen use waned in the 60s, as ballpens became more convenient alternatives. Prized today for their collectible value and status, they are still being manufactured in by Parker, including reproductions of classic designs—like the Parker 51 which was thought to use only QUINK. 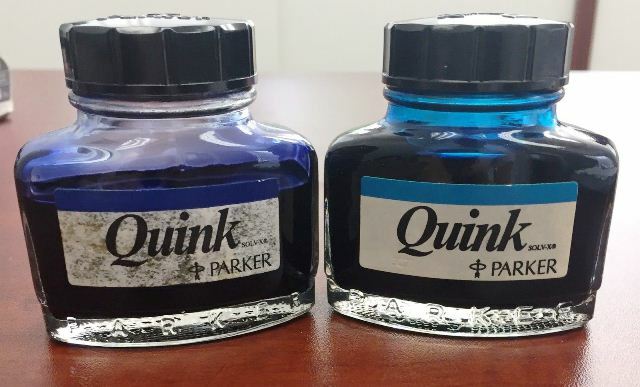 After 87 years, QUINK continues to be produced today, an indelible part of the history of written communications the world over. 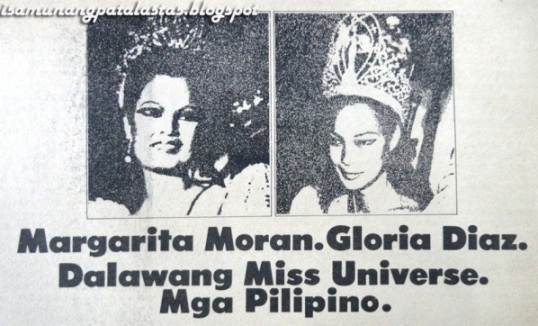 Vintage Philippine advertising revisited--from yesteryears' TV, Radio commercials and Print ads that pushed and sold products while entertaining and engaging us--and which are now part of our pop culture history! Plus other interesting features from the classic age of Philippine Advertising. Don't change that dial...we'll be right back....isa munang patalastas! 110. Brand Stories: COSMOS (SARSI) of Cosmos Bottling Corp.